Wildlife expert Ron Wooten said he started researching the animals after a group of them attacked his dog back in 2013. "I finally found some and took pictures and then looked back at them and thought, 'these are not coyotes.' There's a definite difference in the way they sound and how they interact." he said. Wooten found a carcass of one of the canines that was killed by a car and sent it off to Princeton University. The animal's DNA showed it was 40 percent red wolf. "Overall, it's incredibly rare to rediscover animals in a region where they were thought to be extinct and it's even more exciting to show that a piece of an endangered genome has been preserved in the wild," said Elizabeth Heppenheimer, a Princeton University biologist involved in the research on the pack found on Galveston Island. The work of the Princeton team was published in the scientific journal Genes. 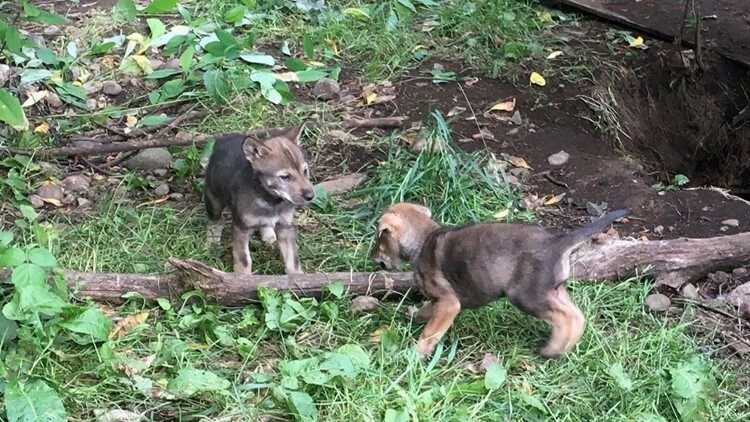 File photo of red wolf pups at Wolf Haven International in Tenino, Wash. in 2016. Researchers say a pack of wild canines found frolicking near the beaches of the Texas Gulf Coast carries a substantial amount of red wolf genes, a surprising discovery because the animal was declared extinct in the wild nearly 40 years ago. Ron Sutherland, a North Carolina-based conservation scientist with the Wildlands Network, said it's exciting to have found "this unique and fascinating medium-sized wolf." The survival of the red wolf genes "without much help from us for the last 40 years is wonderful news," said Sutherland, who was not involved in the Princeton study. The red wolf, which tops out at about 80 pounds (49 kilograms), was once common across a vast region extending from Texas to the south, into the Southeast and up into the Northeast. It was federally classified as endangered in 1967 and declared extinct in the wild in 1980. The U.S. Fish and Wildlife Service in the 1970s captured a remnant population in Texas and Louisiana that eventually led to a successful captive breeding program. Those canines in 1986 became part of the experimental wild population in North Carolina. That group has been declining since peaking at an estimated 120 to 130 wolves in 2006. A federal report in April said only about 40 remained. "Knowing that there's genetic material that will help this species propagate and make it to the next level hopefully escape extinction -- that's a pretty special thing." said Wooden.